A woodworking power tool that is capable of cutting compound angles. The saw can cut angles of up to 45 degrees either side in relation to the vertical fence. In addition the blade can be angled or tilted in relation to the machine\'s base. A woodworking power tool that is capable of cutting compound angles. In addition it has a sliding function that allows it to cut wider pieces of timber than a standard drop saw. 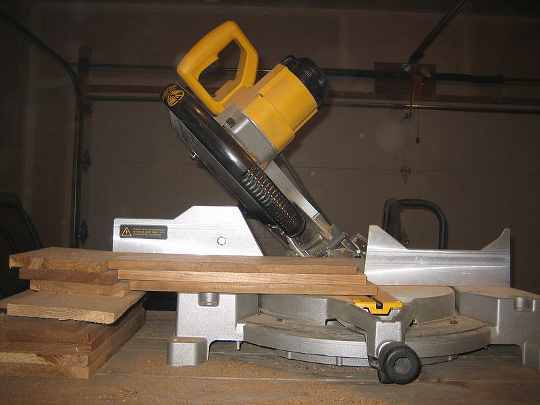 A standard miter saw cuts in an up and down direction only. It can of course be swung around it's pivot point to cut the standard miter angle of 45 degrees both sides of the center line of the saw, and any other lesser angle. So they are great for cutting the corners of picture frames and architrave around doors etc. The compound saw can also cut another angle on the other face of the timber. This extends the versatility of the saw tremendously. Cutting large crown moulding on the flat is one example, but many times on standard mitre cuts, say architraves it is nice to put a slight undercut on them to make them pull up tight on the face. This I have always had to do with a hand plane, but the compound saw will do this perfectly. Imagine cutting the external corners of baseboards (skirting), a standard miter saw is very restricted for this because they can only cut quite small ones before running out of saw depth. The compound saw does this easily. Instead of holding the board to the vertical fence it is laid flat and the cut is made with the saw head angled at 45 degrees. Supposing that you have to cut miters to larger baseboards or say for boxes. Enter the sliding compound saw. Much like the radial arm saw these saws greatly extend the width of the material that it is possible to cut.